FMLab can look after the design of components with a high technical content in polymeric material and assess their feasibility in most challenging projects. To take full advantage of the possibilities offered by plastic materials and their processing technologies, it is necessary to design the componentsaccording to rules that differ from those of the conventional mechanics. It is necessary to bear in mind the properties’ materials and the impact of the component geometry on the execution of the mold and on the molding. It is possible both to create new components, designed from the very beginning in plastic material, and also to reconvert components in metal alloy: this practice is called Metal Replacement. Reduced environmental impact thanks to lower energy used in the design process and the use of bio-based polymers. In recent years high-performance polymeric materials have been developed: they have allowed to replace metals in more and more loaded applications. 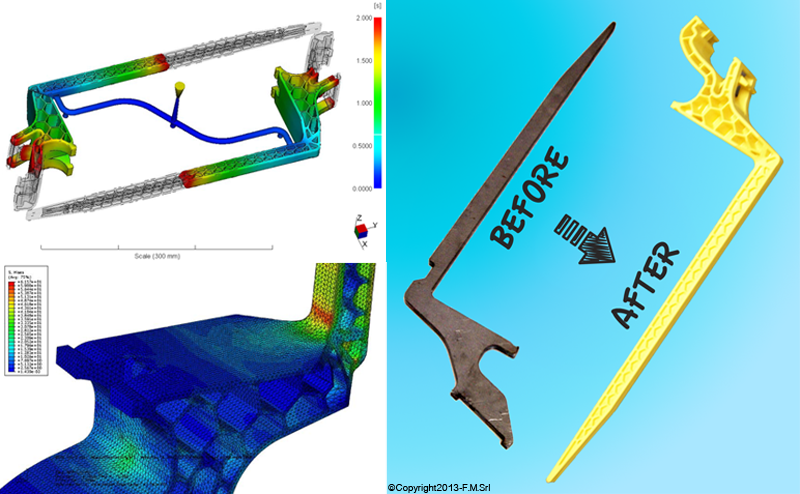 Today you can also use product simulations (structural FEM) and process simulation (injection molding) to achieve better and cheaper products. In particular, the structural FEM allows to predict the efforts which will undergo the article and review its geometry in this direction, whilemolding simulation allows to predict the critical aspects of the production process thus changing the mold.